The City of London is often seen as the business pendulum upon which the entire UK economy swings. But, increasingly, other ecosystems outside of the capital are beginning to flourish, sounding notes of optimism in times of financial uncertainty. The South West of England is one such region, as full-time MBA graduate from the UK’s Bath School of Management, Matt Brook, has discovered. Having previously worked within the equity capital markets team of Barclays’ investment bank in London, he is now a relationship director in its business bank, focusing on supporting the high growth and entrepreneurial companies innovating in the region, a role that the Bath MBA has uniquely prepared him for. The collaborative spirit that the region’s business community is renowned for is something Matt was first exposed to during the MBA. The program’s intimate cohort size—an average of 58 students—and its diverse range of international talent enables a high intensity of interaction and ideas sharing to maximize learning. This approach extends to the program’s academic projects which are carried out through the school’s unique multi-project suite that challenges students to complete five different projects across their MBA. The emphasis is on working with businesses in the region to help solve live problems. “I worked with a number of businesses locally, including both start and scale-up companies as well as mature businesses and divisions of FTSE 100 companies,” Matt recalls. Taught by world leading faculty members in operations and supply chain management—professors Alistair Brandon-Jones and Mike Lewis, for example—Bath MBA students are given a unique insight into operational challenges and practices within business, both from a theoretical and practical perspective. 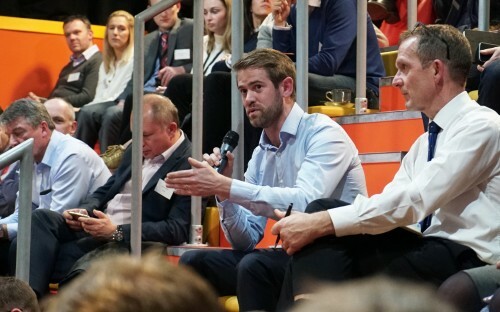 “Being able to put theory into practice—and gaining tools that I now use on a daily basis when having discussions with my customers—was one of the highlights of the MBA for me,” says Matt. Bath School of Management’s close ties to the local business community means more talent stays in the region. Indeed, Matt has settled in the South West after ten years in the financial services sector in London. In his current role, he is hoping to contribute to helping the region flourish further. Part of Matt’s job entails representing Barclays’ nationwide High Growth & Entrepreneurs initiatives in the South West. This includes its Eagle Labs incubator and the Scale Up UK Program, as well as partnerships with local organizations such as SetSquared and Bristol Fintech, among others. He feels regions like the South West, and others outside of London, will be key to the UK’s economic growth in a post-Brexit world. “As well as trading directly with customers all over the world, increasingly companies in regions like the South West are able to attract investment from major international sources, which I expect to continue as companies in the region continue to innovate in sectors with a global reach,” he explains. Small and medium enterprises are the backbone of the British economy. Barclays works with over 44,000 businesses across the South West and provided new lending facilities of around £400 million to businesses across the region in 2017 to support their growth, Matt adds. “I am very lucky to be working in a region with such a collaborative approach to business and a strong sense of the need to address future challenges,” he says.